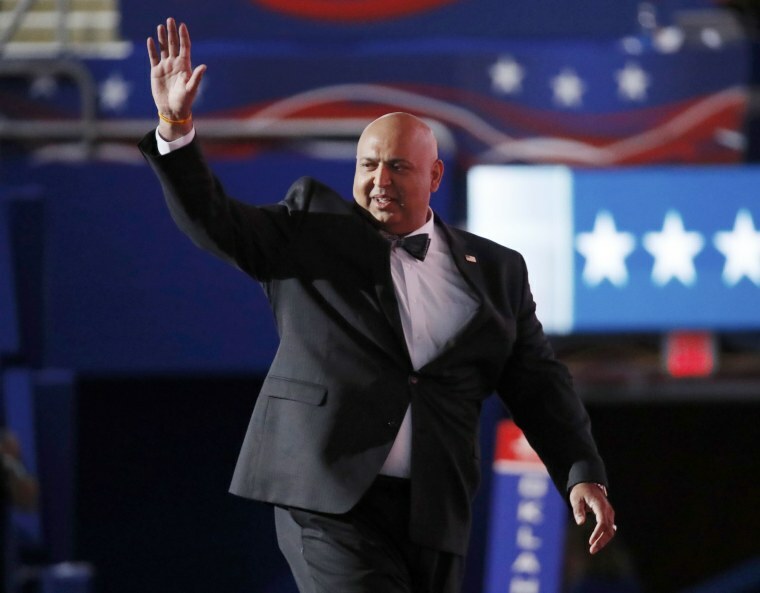 American Muslims for Trump founder Sajid Tarar was at home in Baltimore watching the final night of the Democratic National Convention on television last Thursday when the parents of an Muslim-American soldier killed in combat took the stage. Tarar told NBC News he was “completely shocked” when U.S. Army Captain Humayun Khan's father, Khizr, took out a copy of the Constitution from the breast pocket of his jacket, held it in the air, and asked GOP nominee Donald Trump if he had ever read it. “Mr. Trump is a graduate of [the] University of Pennsylvania, one of the very prestigious schools, and just portraying the picture he’s the dumbest person on the planet, and that even in a high school they teach you the Constitution, that was a shock,” Tarar said. Many agree that Khizr Khan’s speech at the DNC was one of the most powerful of both conventions, grabbing attention on social media and with Khan making appearances on multiple political TV programs. But Trump’s comments soon after — when he speculated about whether Khizr Khan’s wife, Ghazala Khan, was silent on stage because of her Muslim faith — also made headlines and drew the ire of Muslims Americans throughout the country. Many went on social media with the hashtag #CanYouHearUsNow to criticize Trump, who in December first floated a proposal to ban Muslims from entering the country. But Tarar sees things differently. While Tarar said he was proud of Purple Heart and Bronze Star recipient Humayun Khan and the sacrifice he made, losing his life after a car bomb exploded in 2004 outside his base in Iraq, he disagreed with his father’s using the DNC platform to skewer the Republican nominee without having ever met him. He also said Trump shouldn’t apologize to the Khans — even as the families of 17 service members who died fighting for the U.S. penned a letter to Trump saying he should. “For what? For punching back when he was punched [in] his face?” said Tarar, adding that Trump has a right to defend himself against verbal attacks. The past week has been a rocky one for Trump, with GOP leaders reportedly plotting an intervention of the real-estate mogul’s campaign as the Khan controversy dominated the news. Meanwhile, Democratic nominee Hillary Clinton enjoyed a discernible bump following the DNC in Philadelphia. The latest NBC News|Survey Monkey poll, released Tuesday, showed Clinton with an eight-point lead over Trump. With three months left before the general election, many Republicans are saying Trump needs to refocus his attacks on Clinton — a point Tarar agrees with. “Mr. Khan is not his opponent,” he said. Tarar, a National Diversity Coalition for Trump member, said his own mission remains teaching Muslims how to be loyal to America and also to “soften up their image, telling mainstream Americans that all of us, we are not bad people.” He hopes to do that through American Muslims for Trump, which he said has more than 400 Muslim supporters. “I love this country more than my life, and I mean it,” said Tarar, who came to the U.S. from Pakistan as a law school student in the 1980s. But getting Muslims behind Trump in the months leading up to the election could be a tall order. A March Super Tuesday poll of around 2,000 Muslim voters revealed that a mere 11 percent supported Trump, according to the Council on American-Islamic Relations. It’s not immediately clear how Trump’s reaction to Khan’s speech might affect those numbers. But Tarar, who gave the closing benediction the night Trump was nominated at the Republican National Convention in Cleveland, said he believes Muslims have more in common with the GOP than what many people think. Defeating ISIS, Tarar said, is a key goal for Muslim Americans, and Trump, he added, is the candidate to accomplish it.